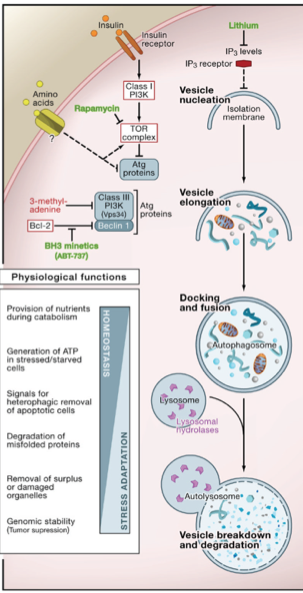 Autophagy, a cellular cleaning process, gets activated in response to certain types of metabolic stress, including nutrient deprivation, growth factor depletion and hypoxia. Even without adequate circulation, each cell may break down sub-cellular parts and recycle those into new proteins or energy as required to survive. This explains why mTOR and autophagy are seen in every organism from yeast to humans. Studies on mutations of animals as varied as yeast, slime molds, plants and mice show that deletions of autophagy related genes (ATG) in animals is largely incompatible with life. That is, most life on earth cannot survive without autophagy. Insulin and amino acids (through mTOR) are the main regulators of ATGs. These also happen to be two of our most basic nutrient sensors. When we eat carbohydrates, insulin goes up. When we eat protein, both insulin and mTOR go up. When nutrient sensors sense, well, nutrients, we signal our body to grow bigger, not to get smaller. Thus nutrient sensors turn off autophagy, which is primarily a catabolic (breaking down) as opposed to an anabolic (building up) process. However, there is a low basal level of autophagy going on at all times, as it acts as a sort of a cellular housekeeper. These mechanisms are implicated in many aging related diseases – atherosclerosis, cancer, Alzheimer’s disease, neurodegenerative diseases (Parkinsons). There is a basal cellular housekeeping provides quality control on the proteins in our body. Mice genetically mutated lacking ATGs develop excess protein buildup inside cells. There is both too much protein, and damaged proteins that are not broken down. It’s sort of like the junk you have in the basement. If you have some old, broken down lawn furniture, you should probably toss it into the dumpster. If you keep it around in your basement, soon your house starts to look like that TV show ‘Hoarders’. 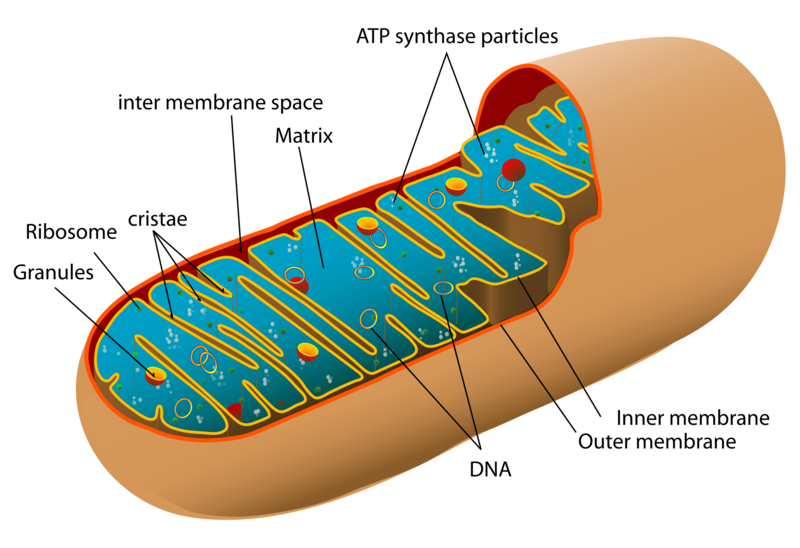 There is a related process called mitophagy to cull the abnormal organelles (mitochondria, in this case). In cancer, it is generally accepted that autophagy can suppress tumor initiation. Since autophagy blocks growth and increases breakdown of proteins, this makes perfect sense. Cancer cells, for example, often have much lower levels of basal autophagy than normal cells. Many of the best studied oncogenes and tumor suppressor genes are intimately associated with autophagy. For example, the well known PTEN tumor suppressor gene blocks PI3K/Akt thus activating autophagy. Mutations to PTEN, found very commonly in cancers, thus lead to lower levels of autophagy and increased risk of cancer. However, it appears to be a double edged sword. As cancer progresses, autophagy may help cancer survival, just as it helps all cells survive in a stressful environment. During times of low nutrients, autophagy breaks down proteins for amino acids, which may be used for energy. Cancer, which may grow so quickly as to outstrip its own blood supply, may thus be aided by increased autophagy, as this would supply much needed energy and deal with stress. The other area of intense interest is the neurodegenerative diseases of Alzheimer’s Disease, Parkinson’s disease and Huntington’s chorea. While these all manifest differently, Alzheimer’s with loss of memory and other cognitive changes, Parkinson’s with loss of voluntary movement and resting tremor and Huntington’s with involuntary movements, they all share one pathologic similarity. All these diseases are characterized by excessive build up of proteins inside neurons leading to dysfunction and ultimately disease. 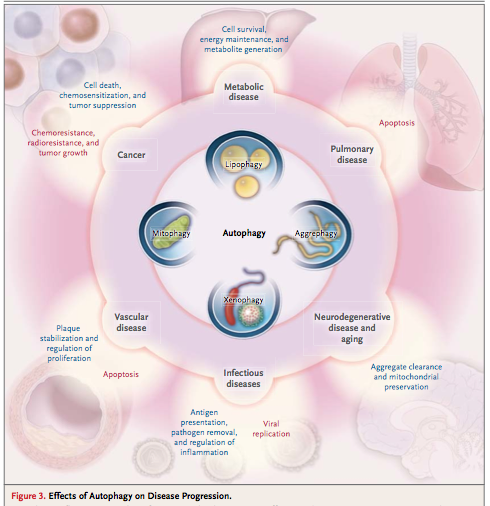 Thus, failure of protein degradation pathways may play a very important role in preventing these diseases. However, the exact role of autophagy in these diseases is still yet to be defined. Further, growing research also implicates mitochondrial dysfunction as a key pathway in the development of neurodegenerative diseases. Studies in humans are difficult to do because of the multiple intersecting pathways. The clearest evidence usually comes from drugs where a single pathway can be changed at a time. The mTOR inhibitors (rapamycin, everolimus) activate autophagy by blocking mTOR. Remember that mTOR is a nutrient sensor, predominantly for amino acids. If there is protein being eaten, mTOR goes up, and growth pathways are allowed to continue. If there are no nutrients being eaten, mTOR goes down, and autophagy goes up. Rapamycin blocks mTOR, fooling the body into thinking that there are no nutrients and this increases autophagy. These drugs are mainly used for the their immune suppressing effects in transplant medicine. Interestingly, though, most immune suppressants increase the risk of cancer where rapamycin does not. In certain rare cancers, mTOR inhibitors have demonstrated anti-cancer effects. Metformin, a drug widely used in type 2 diabetes, also activates autophagy but not through mTOR. It increases AMPK, a molecule that signals the energy status of the cell. If AMPK is high, the cell knows that it has insufficient energy and increases autophagy. AMPK senses the ADP/ATP ratio, thus knowing the cellular energy levels – sort of like a fuel gauge but in reverse. High AMPK, low cellular energy status. High AMPK levels directly and indirectly activate autophagy, but also mitochondrial production. Mitophagy is the selective targeting of defective or dysfunctional mitochondrion. These are the parts of the cell that produce energy – the power houses. If these are not working properly, then the process of mitophagy targets them for destruction. The critical regulators of this process includes the notorious tumor suppressor gene PTEN. This may initially seem bad, remember that, at the same time that mitophagy is increased, new mitochondrion are being stimulated to grow. AMPK for example, will stimulate mitophagy as well as new mitochondrion growth – essentially replacing old mitochondrion with new ones in a renewal process. This is fantastic – essentially a complete renovation of the mitochondrial pool. Break down the old, junky mitochondrion and stimulate the body to build new ones. This is one of the reasons metformin is commonly promoted as an anti-aging compound – not so much for its blood sugar effects, but instead because of its effect on AMPK and autophagy. Notice how mTOR is the most central nutrient sensor to impact autophagy. mTOR integrates signals from insulin, nutrients (amino acids or dietary protein) and the fuel gauge of the cell, AMPK (all energy including fats) to determine whether the cell should divide and grow, or involute and become dormant. Excess nutrients – not merely carbohydrates, but all nutrients may stimulate the mTOR system and thus turn off autophagy, putting the body into a growth mode. This encourages growth of cells, which, as I will repeat often, is not usually good in adults. These pathways are central to life on earth because they are the link between nutrient status and growth. For single celled organisms, if there was not enough nutrients, they simply went into a dormant stage. Think about a yeast. If there is no food, it simply dries up into a spore. When it lands on water, it blooms and starts to grow. So mold is sitting in your house in a dried up, inactive state. If it lands on some bread,it starts to grow into a familiar mold. It only grows when there are sufficient nutrients and water. When these nutrient sensors detect low nutrient availability, they tell our cells to stop growing and start breaking down unnecessary parts – this is the self cleansing pathway of autophagy. Here’s the critical part. If we have diseases of excessive growth, then we can reduce growth signalling by activating these nutrient sensors. This list of diseases includes – obesity, type 2 diabetes, Alzheimer’s disease, cancer, atherosclerosis (heart attacks and strokes), polycystic ovarian syndrome, polycystic kidney disease and fatty liver disease, among others. All these diseases are amenable to dietary intervention, not more drugs. I am 63 and concur with you Richard. I’ve been able to keep my A1c below 6.0 with diet & exercise for the past 13 years. I get checked every 6 months. Try fasting for glucose control. At day 5 Growth hormone increases significantly sparing lean mass while decreasing fat mass. More natural and less counter signaling.See Dr Fung and Jimmy Moore book on fasting for more information. I’m 4 days in to a 5 day fast for a NY cellular cleanse and desperately wanted to stop. But you’ve all convinced me to keep going with all of this science talk. So thank you. Interesting with seizures from very low blood sugar, possibly in combination with a very high-carb/low-fat diet which keeps the insulin high, drives BG down and disables fat metabolism = ketones. It may to me explain why a then 12-year-old granddaughter started to get seizures shortly after becoming vegetarian, on her own insistence! Today we make sure she is taking Magnesium daily and thought that was sorting it, but it may really have been that we insisted that she must eat eggs and use lots of butter, which she continues. So did you stop or continue metformin? I’m making a similar decision. I find this article confusing and a little worrisome. I’ve had 3 melanomas and a pre-cancerous colon polyp in the past 6 months and I had thought that the increased autophagy from fasting would (eat away) the cancer, but this article seems to be saying the opposite. The autophagy will protect the cancer cells. It also says that the autophagy will prevent new cancers from forming…which is something I want, but to fast or not to fast, because I may have more cancers already formed that have not been detected yet. What’s the safest practice in a case like this? Fantastic article. I am a physician’s assistant and feel great about understanding the entire article. I practice intermittent fasting, and have thrown in a few extended fasts. 3-5 days. I can’t seem to make it longer. I started Keto 7 months ago, and am doing it all for an essential tremor. I’m 52, and loving the benefits. I feel 29. Thank you Dr. Fung. I’m wondering if I should be pushing for a 7 day fast? My tremor is better except after a hard tennis match? Then I shake? I would love to see a joint presentation with Dr. Jason Fung (Obesity Code, Fasting, et al.) and Dr. Garth Davis (Proteinaholic) on our current love affair with “high protein” diets. Dr. Colin Campbell (The China Study) could add his views on the health benefits of a plant based (vegan) diet. I have followed Dr. Fung for years on YouTube and am so appreciative of his ability to put his medical knowledge into layman’s terms. Thank you. I am very appreciative of Dr. Fung’s ability to convey his medical information in layman’s terms. Unfortunately it is not “medical” information. It is basically “heretical medical” information. 99% of what he has to say is actively ignored if not slammed by mainstream medicine. I am a huge fan of Dr. Fung, just to make that clear. I have noticed that the paleo perspective is sneaking into all kinds of health discussions. This may seem a bit petty but none of these processes or medications decrease all cause mortality or specific mortalities. If they are effective at all they may delay mortality. If so, the question then becomes, by how long they delay mortality. Another reason to love Dr. Jason Fung. so metformin is going to increase autophagy? does this, along with the blood sugar lowering effects outweigh the the side effects? I have managed to avoid any drugs using diet and fasting alone, achieving a hbaic of 5.2 down from 7.8. Should I take the metformin originally prescribed for increased autophagy and anti ageing properties? Any stories of autophagy reducing gallbladder polyps?